As a creative agency our team is passionate about graphic design. By combining creativity with commercial awareness, we can produce designs that don’t just look great, they work too. Our approach is to explore all the options to find the best solution for your business. It’s important to consider the type of media that’s being produced. The approach involved will differ from one form to another, for example a business card needs to be approached differently to a banner. We have experience designing for a wide range of media so can make your brand stand out in the best way possible. Who is it talking to? The style of your project will depend a lot on who you’re trying to communicate with. Do you need to appear corporate or fashionable? Serious or fun? We’ll consider your audience to create designs that attract the right people and enhance your brand. From business cards to brochures, folders to flags, packaging to point of sale, stickers to signage, we know how to make your designs stand out and represent your brand in the best possible way. Because every client is different, so is every project. Your designs will be unique to your business, tailored to suit your company’s brand. Whether you have assets you want to include or you’re starting from the very beginning, we’ll work with you to make sure our designs work for you. 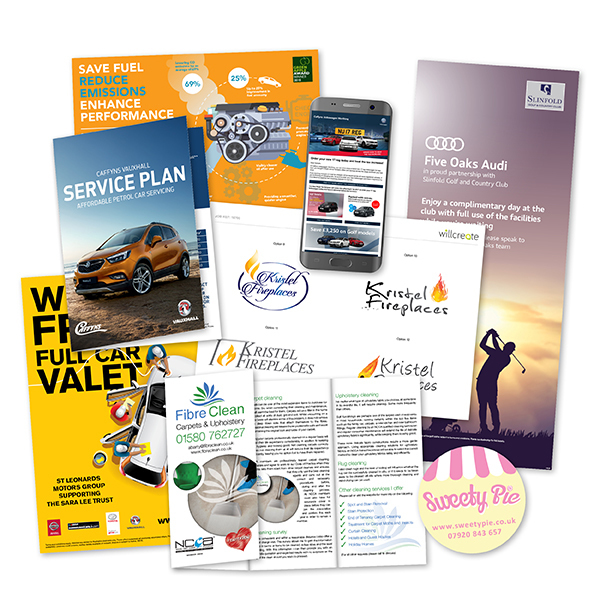 Our expert team of graphic designers can create any of the below materials for you and your business. Get in touch today for more information. Great design will communicate your message to the right audience and represent your brand in the best way possible. Whether you need help with a logo, a website or simply new stationery, contact WillCreate to find out how we can help.